Luna : They're called Thestrals. They're quite gentle, really... But people avoid them because they're a bit..."
Harry: "Different. But why can't the others see them?" Luna: "They can only be seen by people who've seen death." We think being a little...different...can be a good thing. Don’t believe us? Why not walk a mile in Luna Lovegood’s shoes and see if the world isn’t full of more magic, mystery, and delicious pudding than you ever thought possible? Oh, that’s right, Luna walks barefoot, at least when she goes to feed the Thestrals. But we know for a fact that she wears shoes to bed because she sleepwalks, so you could try that. Anyway, this Adult Luna Lovegood Costume will have you feeling oddly powerful in the best ways possible, and faster than you can read the latest issue of The Quibbler! Any real Harry Potter fan knows that Luna is amazing and that her unique identity often leads to serious heroics, like when she rescues Harry from underneath the invisibility cloak on the Hogwart’s Express while searching for Wrackspurts. When you wear this costume, you can get a pair of Spectrespecs for yourself and instantly become an indispensable member of any crew at any party. Of course, you know that once you don this Ravenclaw robe in Luna’s name, it’s time to join Dumbledore’s Army. But we’re not worried; you’re brave and brilliant and able to conjure your fully formed rabbit Patronus easily. 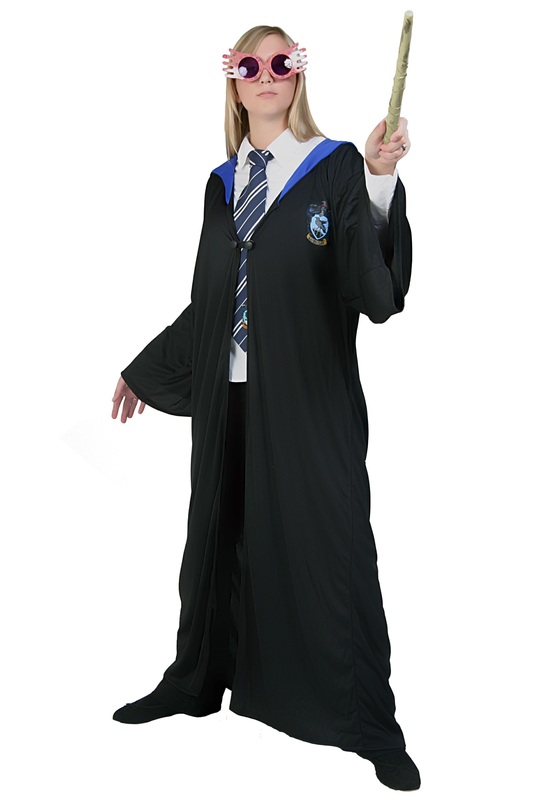 Enjoy the evening as your favorite Hogwarts character, and don’t even worry about misplacing your Spectrespecs, wand, or even your charm necklace to keep away the Nargles. As Luna so wisely reminds us, “the things we lose come back to us in the end.” Now, where’s that pudding?